Photos of Abby's arrival in Cabo san Lucas - Many thanks to Ted Caloroso! Good to see the boat getting ready to try again. Get back out there Abby! Great pictures Abby! Just started following your adventure here last week. Best of luck and thanks for letting us all be a part of it. Hope you can get out of Cabo okay and the rest of the journey goes according to plan! Glad you made it into Cabo safely. I have been watching your progress with great interest from here in the Black Hills of South Dakota, and pray your journey and adventure continue to go smoothly. Good luck with the repairs. There are some great pictures, not only here, but on your website as well. Are there any that are in high resolution that could be used as a wallpaper? I especially like the 2nd one from the top with Wild Eyes listing slightly to starboard and a bit of wind in her sails. Godspeed with your repairs and resuming your journey. This is absolutely 200% amazing... Sailing around the world? It's such a romantic concept! I love this! Great photos, looks like a very picturesque place. Keep them coming. Good to see the boys working to get you up and running. Great pictures! Thanks for sharing your story! You are attempting what I have dreamed of for over 50 years. I wish you the very best. that's so cool! Abby, you are so beautiful! Good luck out there. Hope the problems are sorted out soon. The boat looks great, including that nicely designed dodger. Looks like you've got quite the tech team there to sort things out. Glad to see you're getting the necessary upgrades for power, etc!! Looking forward to tracking you when your start your non-stop adventure from Cabo!! Kewl pix, Abby. Wild Eyes and her Skipper look pretty good, even down in the engine room. Hope the repairs go smoothly. 1. Came to know about your adventure from Jessica's blog. Great to know that now there are three of you out there - the other being Commander Dilip Donde from the Indian Navy. 2. My introduction - I am also an Indian Naval Officer and I was responsible to get Dilip a boat. Was posted at the Naval Headquarters when this project (Sagarparikrama) was conceived and we managed to get Dilip a fine indigenous boat in time for his adventure. I have been enriched by this experience and can only try to imagine how much the three of you are going to achieve. Have been following Dilip's progress ever since and got a lead to Jessica's page and now yours. 3. I believe you have suffered a minor blip. But the brighter side is that have managed to visit Mexico. Maybe it is destined that you shall start and finish at Cabo. 4. Be assured that there are many enthusiasts like me who are following the progress of all three of you and we are all praying that you achieve your dreams. While, some reports have suggested an element of rivalry, I sincerely believe that all three of you are chasing your individual dreams and will come out with these dreams fulfilled and richer for the experience. The three of you are inspiring a generation of young boys and girls - that in itself is a great achievement. Take Care and all the best. Varuna (the Sea Lord) will witch for you. Jump on board! He'll need LOTS of advice for this one!!! 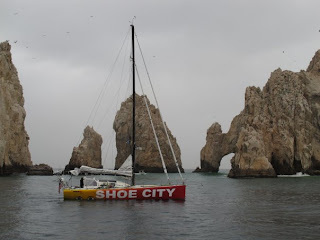 It is so much fun to see you sailing into Cabo...it made tears come to my eyes to see you safe! Even though it delayed your journey, I bet it was good to see family, friends, and to make a new friend....what a joy for you! It was meant to be. Our prayers are with you for a good start when you are ready to go, and we are really anxious to see what comes next. When I was a young girl I spent many weekends out on the ocean with my family, usually around Channel Islands...and the occasional dolphins, shark, and even whale sightings are not something you ever forget. My heart is with you; the angels will be watching over you; the support of the world surrounds you! Nice Pics.... If I would have thought of it.... I would have suggested boatpics.com to do a fly around picture taking session when you left MDR. I got lucky one day and was in the near vicinity of a race that they were flying and taking pics on... and I ended up buying one of his pics of my boat from the air. Maybe when your on your way back in after your voyege is complete some fly by pics can be arranged. You go girl!!! Wish I had your nerves. 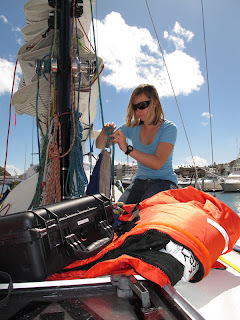 Jessica has continued to make good progress this week averaging over 120 nautical miles per day and earlier today passed the 12,500 nautical mile (nm) mark of her around the world voyage. I agree with whoever mentioned the angle of the rear solar panels should be pointed South or be at least flat. Are they angled the way they are to get a push when you start heading East in the Southern oceans? How about a close-up pic of the new batteries when you're done with the instillation? And personally, I'd like to see what your self-steering hydraulic system looks like. Like the shades, you look cool woman! Great job on the pictures, I like the one where it looks like you’re getting ready to go up the mast, are you, did you. How about some follow-up pictures of that. The rest of the pictures look good to, that one just caught my eye. The one with the rocks in the background and the seagulls flying above is beautiful, Shoe City should love that one. It looks like everyone is serious and really into repairing “Wild Eyes”, I hope the operation is successful and she sails on. Well Abby, good luck to you and the crew, and I hope things go well for you all. I’m anxiously awaiting your next post (when you get the chance) to see how everything went. May God hold you in the palm of His hand and may the Angels keep your sails full, and the gods of electricity fix your problem, and I, I will be praying for you. Is that one of those floating suit cases like in "Joe vs. the Volcano" with Tom Hanks?!!! They turned out to be really handy! Do you have lots of DVDs with you? Don't be too disheartened, I'm sure you'll be on your way soon. Hey Captain,Just finished reading storm passsage.Ug Hope your journey does not fill with grief. Please bring EPOXY, fingernail polish nail remover, hand cream, body cream, makeup, you know girl stuff. It will lift the blue days. what steering has wild eye got? Remarkable! What's going on in picture number four? What in the hell is wrong with Americans. Don't they know they have a 16 yo who is taking on a mammoth challenge. If we did not have adventurers like you, we would all be sitting in England because nothing would have been discovered. I am disgusted with the lack of support in your blog. Tell them to get up off their bums and start supporting you. just started following your journey...amazing. you are doing things that i never even dreamed of at that age. have fun, be careful. i will keep reading and keeping you in my prayers. And was astonished by what I read. He is planning to do his solo voyage The Wrong Way Around. Instead of riding the Prevailing winds West to East, he will be continually bashing into the wind and waves as he goes East to West. Believe he said only 4 others have done this, and if successful he'll be the youngest by 12 years. I was just the 2nd person to post a comment. He can use support. Note: This is still Pie in the Sky until he gets the sponsors required to outfit a boat, but if he actually takes off on the trip, would be fascinating to follow. In my comment to him I posed a blunt question: Is he going the Wrong Way Around because he wants to, or because this is the only way to find sponsors? It would be a brutal, long, and dangerous trip. HELLO ABBY - Glad you arrived safely and work is underway for "Wild Eyes". Hopefully you will be on your way again soon. Look forward to keeping up with you. Hi Abby, my class is following you for a school project. We're all so excited! I am wondering some things like if your team came out to help you, does this mean you are still planning to sail solo? Or will your team be tagging along? Anyway the teacher will probably know. We are going to make a big chart to mark all the places you visit! You are so lucky! School is boring sometimes, but thanks to you we are dreaming about traveling the world. Hello Captain Abby, yes I got to know of your attempt on Jessica's blog. encouragement your way... You might want to see if you have a good bird book aboard, Jess was wishing she had one! Hi Abby, beautiful pics, thank you! Cabo seems to have been the best pick to make your pit stop. A real sailing harbor, a picturesque touristic place, and friendly people. I don't understand well what are these contraptions people are working on, probably the autopilots. It looks like some pilotosaurus to me, or an Emperor Crab's open skull with brains and nerves everywhere. Good to have several bearded men to put their hands inside that "thing". That could still bite or pinch you finger, who knows? Good repairs, sunbathing and partying with Emily before the second launch. Remember being careful about what you eat and drink, and enjoy your last nights in a real bed! Stretch your legs and go for a long walk - you won't have the opportunity for a long time once you set sail again! Glad you are having a breather to get your "house" in order. Safety first. Even though you are starting over, remember the Wright Brothers didn't get up in the air the first time. Maybe when you go past Australia, Jessica will sail out to do a wave by. Good luck on the restart. Sounds like you have a great team. Keep posting text and pics. Great pictures, thanks for keeping us informed. I hope your team can do all the works that need to be done in a short period of time so you can start your trip as soon as possible. Thanks for your explanation, I hope it is like you said and WE will avoid the worst of the weather that they may encounter. It is probably a mix of things, good weather predictions, a fast boat to go around the worst of the bad weather and also robustness to confront the bad weather that cant be avoided. ps. I havent seen the shroud. It will be on display from april 10 to may 23 2010. The last time it was exhibited was on 2000. What great pictures Abby...thanks so much for the up-dates. We are so glad you made it to Cabo safely.My class and I think you are very brave sail around the world.We know you are very encouraging to young boys and girls around the world. Great news that you are getting repaired/outfitted. Keep sailing and Capt. Slocum will share many a confidence with you once you are back out sailing. My class and I think you are very brave for traveling the world. We know you area big inspiration to people. You and Wild Eyes look great! You had a good shake down cruise and now have the opportunity to fine tune that lovely hot rod. My gosh what better place than Cabo? You and Emily stay out of Cabo Wabo, OK! Could you tell us a little more about Emily. Is she cruising the world as well? Thank you for the great pictures. You and Wild Eyes are definitly becoming one. May God Bless you and keep you safe Abby. Abby--Great photos! I also love how fellow sailors are banding together to assist you. It is wonderful to hear of such selflessness. We are praying for your speedy repairs and return to your adventure. If anyone is interested, the following link lists all (?) of the current circumnavigators, as well as proposed circumnavigations. It definitely shows what a rare breed solo round the world sailors are, and re-emphasizes just how remarkable Abby's trip really is. Many Blessings to you Abby, and your team , during your shore time. My class and I think you are very brave to sail around the world. We know you are a inspiration to people. Just found your blog today. I heard about your adventure not too long ago. I'm glad to see you're sharing this with the world as you do it. Although, I have to say, I have a hard time posting when I'm traveling. I get too caught up in everything and by the time I'm ready for sleep, I'm ready for sleep. So thank you for taking the time to share your adventure with all of us. Abby you rock! I never used a blog before but because you and your jorney around the world I will learn more about. I just want to tell you that Im verry amaized with what you do and I wish you luck on your jorney. Good job Abby! Great photos! Best Wishes from Seattle! Fun pictures. Though the interior shots dont mean much to me as I am less then mechanicly inclined. 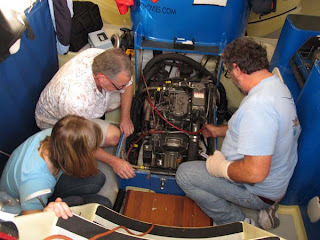 Still, it's fun to see inside your boat and all. So, here's a story for you when you get bored. turns recounting their adventures at sea. Noting the pirate's peg-leg, hook, and eye patch The sailor asks "So, how did you end up with the peg-leg?" The pirate replies "We was caught in a monster storm off the cape and a giant wave swept me overboard. Just as they were pullin' me out, a school of sharks appeared and one of 'em bit me leg off". "Blimey!" said the sailor. "What about the hook"? "Ahhhh...", mused the pirate, "We were boardin' a trader ship, pistols blastin' and swords swingin' this way and that. In the fracas me hand got chopped off." "Zounds!" remarked the sailor. "And how came ye by the eye patch"? "A seagull droppin' fell into me eye", answered the pirate. "Well..." said the pirate, "..it was me first day with the hook." Abby,....I think it's great you are attracting 8 and 12 year olds to comment, and I'm sure you must be feeling a sense of pride and responsibility as you become a role model. Keep up the good work and snap a pic of those batteries when you have time. We're still following your progress from Kodiak, Alaska. My 5th grade class is excited for you and wish you the best of luck! Very very rough calculations, but seems there's a good chance, Abby and Saito-san will cross paths. Great photos of your arrival in Cabo. Do not get dissappointed with early trip problems as Reid Stowe (1000 Days At Sea) hit a freighter shortly after leaving New York but completed his dream. Enjoy your voyage... It is so Great! Just dropped in and what do I find ? Nearly the same crowd hanging around Jessica Watson's blog. What's wrong with all of us ? Haven't we got some dull shows on TV to follow, that we have to cram onto the boats of some girls running away from boys in their Prime Time to make headlines in a world full of disasters and showbiz ? Never mind, let's have some fun here and keep Abbi entertained as well through a journey with kickdowns, sunburns and can we expect a mastclimb as well ? What ever happens here a happy "GO ABBI" from me. And to my fellow bloggers who have read my comments before: Stop worrying,I'll try to keep it less acid, unless the situation requests a straightforward opinion. So let's sail off with Abbi into the sunset and have lots of fun. hey there abby, don't be discouraged girl, just a temporary inconvenience, that's all! Cabo looks nice. Isn't it wonderful how local folks pull together to help you in your time of need! am jealous of you abby! always keep the photos coming OK? We live and breathe your adventure!!! You will be sailing in no time. Nice photos..I especially like the one with the jagged rocks. To Subir: Well said about each person fulfilling his or her own dreams. The real competition is always with our own selves. Both Abby and Jessica are 16, and a few months difference is only a technicality. They are inspiring many people to live their dreams, and that makes them both winners! What is truly most important is that each returns safely. 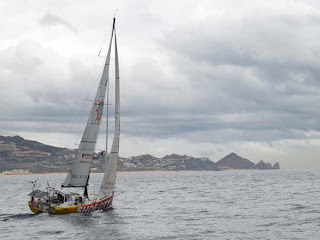 There is also a german solo sailor that recently rounded cape horn. Thanks for the photos. Will you be letting us know what type and size batteries you are installing? What is the size of the solar panels you are using now. 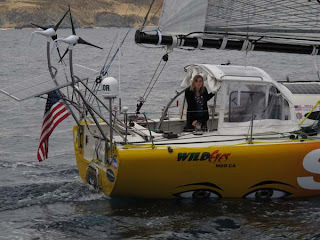 What would the plan be on power if you were to take a knock down like Jessica did and you loose your stern solar/wind? Hey Abby - I can't remember how I found out about your voyage, but hats off to you! I can't imagine taking on such a journey. You are a brave adventurer and I wish you Godspeed. I will be following your journey with much fascination. Take care and enjoy your time. Take lots of pictures and keep a journal. You'll be thankful when you tell your children about it!!! When one woman, for whatever reason, has the opportunity to lead an extraordinary life, she has no right to keep it to herself. @Grant, see Cassie's comment on Ryan's. If she's right, it was kind of bizarre, especially when you see the stinging advice on the previous entry that is still in place?! hey abby me and my history class at CCMS read all about your blog and see where at ! my teacher sen't you a post a few weeks ago ! i hope you can post us in you blog one day !!!! !=) i always pray that you will make it all the way and not be attacked by pirates !!!! !we'll i hope you can get all your sleep and boat fixed and i will be reading your blog everyday !!! Is having a firearm on your boat while in Mexico? I know that Mexico has some pretty strict laws when it comes to bringing guns in from the US. If you are traveling w/o a gun onboard, what will you use for protection against threats from pirates, or other attempts at a hostile takeover or kidnapping/assault? Thanks for your time. Best of luck on your venture. I've been following jessica and abby from day one and i can't believe the difference in their yachts;jessica's yacht an s&s 34 a proven design and 69 hobart winner,Jon sanders sailed one around the world so did jesse martin and david dicks they all made it back unassisted and in one piece.now lets have a look at abbys machine a water ballested open 40 designed to race around the world fast and with 750 litres of water is like having 10 men on the rail,the power this generates is incredible enabling the yacht to do speeds inexcess of 20 knots quite easily and under bare poles with a big ground swell this boat will free fall down waves at 20 knots plus and very hard to control hand steering let alone with an auto pilot even with sea anchors deployed.I support these young women in their record attempts but i would like to see them make it back safely and with yacht in one piece? There are several Newsvine members watching your progress. We admire your courage and determination. Great Photos. I think it's so cool to sail around the world. I will have to check back on this. Also, I am not sure how you publicized this blog? My blog receives very few hits and is not listed in Google. I can't seem to get it listed... barnessucks.blogspot.com Maybe that is because of the title? I am absolutely in awe of your skill, tenacity, bravery and drive. Young people like you give us older folks hope for our future. You go girl. Have fun in Cabo, sounds like a lot of very supportive people on your side. Great shots of the boat. What is the make and model of those wind turbines and what are they attached to (I know batteries, duh) What kind. I know rechargeable, duh). Best wishes and safe journey from Grand Canyon Park Ranger. Hallo Abby, Recently found a link to your site via Jessica's. I am not sailing close to Mexico now , else we could team up. Great pictures Abby, thanks for sharing..hope you set sail real soon. like to see boat and stuff you're in. simple and neat, looked comfy 4 you..
@Tim Gough: Thanks for the pointer, Man! Hilarious. Ryan removed my comment from his site. And HOORAY for Cassie for virtually reposting it on Ryan's site. The big question that got me the boot was: Is he going the Wrong Way Around because he wants to, or because this is the only way to find sponsors? SO, FOR ABOUT THE 5TH TIME . . . LET ME SAY HOORAY FOR MARIANNE OR WHOMEVER IT IS THAT MODERATES ABBY'S BLOG! I greatly admire the discourse they have allowed here. I've written all sorts of stuff that apparently wouldn't be allowed on Ryan's blog. I've asked questions, proffered all sorts of unsolicited advice, and I'm sure over and again made things perhaps uncomfortable. I've enjoyed seeing -- and am often impressed by -- the discussion that follows. Let me place such predictions in the following framework. I see the site as kind of a parlor . . . Think of a Jules Verne drawing room, with walls of varnished mahogany panelling, covered with intoxicatingly beautiful oil paintings and heavy with books you'd want lifetimes to explore, the corners filled with telescopes, the tabletops covered with microscopes, warm fire behind the fender, winged-back chairs with Ottomans (as in the Empire) Porter's chairs from a hotel in Paris, sofa's with pillows and blankets for catnapping between dispatches arriving on the telegraph. You get the picture. And a dear friend comes in, shaking off their overcoat and says, "Have just heard from Lloyds of London that Abby has put into Cabo. What could it mean?" You and Jessica (our Girl) are fine examples of young womanhood both attempting what some would say is an impossible task,the courage that you have shown so far is proof that you will acheive your goal. It would be great if you and Jessica could get together when your voyages are over,I'm sure that you would have a lot to talk about. God bless you, you are one great girl! Those are fantastic photos. Thank you for sharing. Can't wait to see some from "out there". All the best with repairs. You'll soon be on your way. Another young lady on the adventure of her life. I've been watching Jessica's progress and I am just as interested in watching your voyage, too. You are a brave young lady. You have a small hiccup at the beginning, Abby, but you will be able to start over and that's great. I hope you get plenty of rest before you set sail again. I'm looking forward to your blogs and hearing about your progress. God has you in the palm of his hand throughout this incredible adventure. Remember to call on his awesome power when tough times come. Nice photos and 10/10 for the blog. Well done. Glad to hear you're ready for the second start. Go, Abby, go! Have a good time. Hi Abby,I appologize I accidently called you Gabby insread of Abby.good luck! Great job Abby. I hope you don't get captured by pirates! So.. as I do every Superbowl Sunday.. I went down to my boat to take a nice sail. I alwasy sail single handed.. And as I was sitting out there in a beautiful 10kt wind with 6'seas.. I tried to imagine myself in Abby's shoes. On days like THIS... awesome. Just ME and the ocean.. Nice swells and good wind. 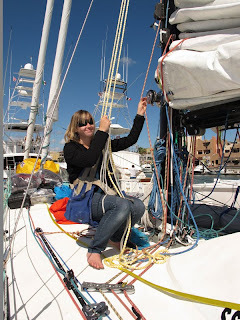 Perhaps when the next gale warning comes up I will go sit on my boat and ponder the same things about such a large sailing goal as Abby and Jessica and all the other sailors out in the middle of the ocean with mountian sized swells and 40+kt winds. Sail On.. Sail Safe.. Post often and have FUN. I'm retired and I spend my days reading on the internet. As a young man I built 40 and 55 foot racing cruising sail boats in Newport Beach. As an older man I published a magazine in Arizona. I read primarily about global politics and war. It's quite depressing really so your adventure is a great diversion and it reminds me that altruistic young people are still a reality in what's become a brutal world. I'm right here, following you young lady and I wish you well. Here's a great Beach Boys song for ya. Trust in God Abby.. you're in my prayers. And have a fun time. rio de idaho. Welcome to the wild adventure. WOW! Abby you are an amazing girl. I thought getting married at 16 was a stretch haha but sailing around the world. May God be with you on the waters! Thank you for Blogging your experiences. Its a massive challenege. I wish you well and loof forward to the updates. Wish Abby's the best, glad she is all right and staying dry. She has great talent to accomplish what she has completed so far. Most folks only dream of a trip around the world. My self, I have never been out of the country.